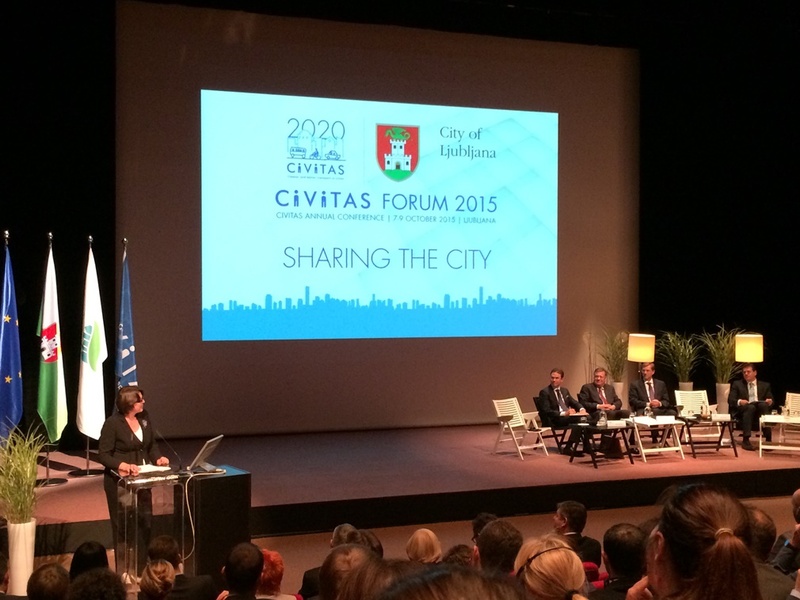 Alumni from EDIT Summer School 2015 Ljubljana showcased their projects at CIVITAS Forum Conference 2015 that was held in Ljubljana between 7 and 9 October. In Europe, the road transport is currently responsible for 40% of carbon dioxide emissions, while the urban traffic is responsible for 70% of other pollutants in our environment. In recent years, many visionaries and even policymakers have dreamt of creating societies where transport is green, safe and sustainable, but more often than not these dreams have remained on paper. However, CIVITAS is a breath of fresh air in this respect, introducing change to over 200 European cities towards greener transport under a single dynamic and very active network. The initiative was launched in 2002 with the goal of redefining transport measures and policies to improve transport in cities. More specifically, CIVITAS has helped introduce numerous innovations and measures that have already made transport more environmentally friendly in over 60 European metropolitan areas. The theme of the CIVITAS Conference 2015 was “Sharing the city” with a focus on sustainable urban mobility as an important driver for building an accessible and livable city for all. Alumni from EDIT Summer School 2015 Ljubljana that were working on Mobility-as-a-Service and Sustainable Mobility in Ljubljana presented their projects to the participants of CIVITAS Forum 2015. In collaboration with the Summer School Alumni, Comtrade prepared a publication to present the concept of Sustainable Mobility in Ljubljana. You can read it here.